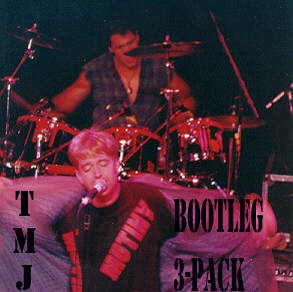 If you want a professionally recorded, mixed and mastered live CD from TMJ, go buy Live at Least. But if that’s simply not enough Joy, or you miss hearing Sandy, this 60 track collection is for you. We’ve selected three shows, from ’91, ’93 and ’96. The first was recorded with a 24-track mobile truck, the second was taped by a fan with a Walkman, and the third was recorded off the board by the band’s soundman. Together they give you the whole range of TMJ live – songs from Green Eggs and Crack through …Finally, a bunch of covers, the usual banter, inebriation and equipment malfunctions. A lot of it’s inspired, some of it is merely unfortunate, and every once in a while the tape ends before the song does.